Above and below: Mike Read MBE (centre) back in 1980 presenting the trophies to winners of the Bury St Edmunds Swimming Club (The Bury Beavers) annual club championships. Also in the picture starting at the back, left to right: Michael Ransom, me, Cheryl Cole, Andrew (Andy) Taylor, Lorraine Smith, Stephen Alan, Angela Stevenson. Middle row: Anna Gittus, Mike Read, Melanie Berry. Front, kneeling, Nigel Stemp. I received an e-mail this morning stating that Mike Read had received an MBE for services to swimming in The Queens New Year's Honour's list (page 44 of document). Way back in 1980, I first met Mike when he presented the trophies to us at our annual club championships presentation evening. It was there that I first heard the title "King of The Channel". 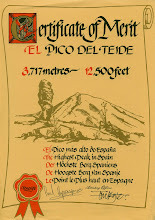 He explained how he had swum The English Channel 19 times then (now 33). My best friend, Nigel Stemp and I were simply amazed at this, and it was on that day, back in 1980 that the seed was planted for me wanting to swim the channel. In 2006 when I decided I wanted to swim the channel, I hadn't seen or heard anything of Mike in all of those intervening 26 years. However, he was the obvious and first choice for me to "Google" and try to get in touch with, and he was extremely helpful and friendly when I did get in touch. 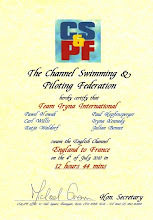 I hadn't got involved in all of Channel Swimming politics then, and didn't even realise there could be such a thing. I didn't know there were two organisations. 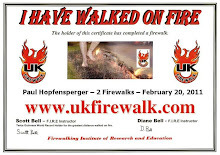 When I found out about it all, it reminded me of the 'Monty Python' film 'The Life of Brian'. 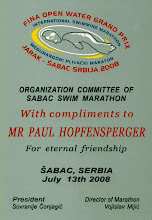 On one side you had 'The People's Front of Judea' (The Channel Swimming Association Limited) and on the other side you had 'The Judean People's Front' (The Channel Swimming and Piloting Federation). Both doing the same thing, getting people across The English Channel, but both with different sets of viewpoints, and means of doing it. I had stepped out of the cauldron of the Bury St Edmunds Town Council versus the St Edmundsbury Borough Council, straight into another quite different political arena! 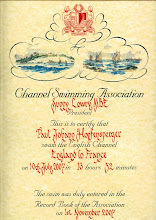 Mike Read was the Chairman of The Channel Swimming Association Limited, and it was with them that I successfully completed my first English Channel swim. Mike helped me along the way, turning up at Felixstowe on December 26, 2006 wearing his 'Bury Beavers' sweatshirt which he had been given on that night way back in 1980 (pictured below). 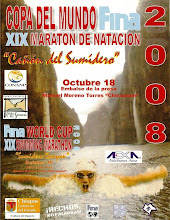 He inspired me to complete my longest cold water swim at that time - 1 mile @ six degrees Centigrade. I was so, so cold, that if he hadn't been there I think I would have got out after 5 minutes! I will never forget his words when I finished the 35 minute swim. He came running down the beach and said "If you can do that, you can swim The Channel". Those words really inspired me to achieve my goal. Above: Mike Read and I in the icy waters of The North Sea at Felixstowe, Suffolk on Boxing Day, December 26, 2006. 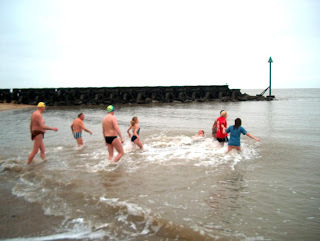 When I organised a 'Virtual Channel Swim' on May 28, 2007, again, he was there to be part of my virtual channel swim team which raised over £1,800 for CLIC Sargent Children's Cancer charity. 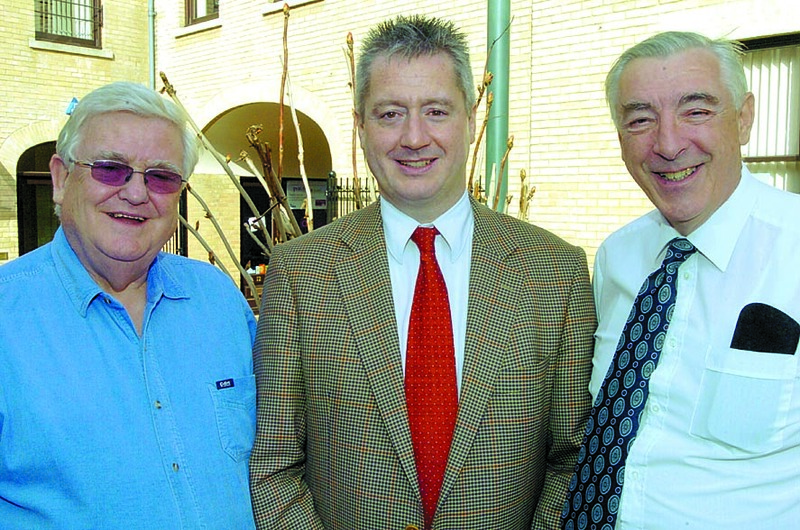 Above: Top left to right: Don Neate, President of West Suffolk Swimming Club in 2007, me and Mike Read outside the CLIC Sargent offices in Bury St Edmunds. Bottom, left to right: Me, English Channel aspirant Tom Gunning and Mike Read after completing our Virtual Channel Swim. 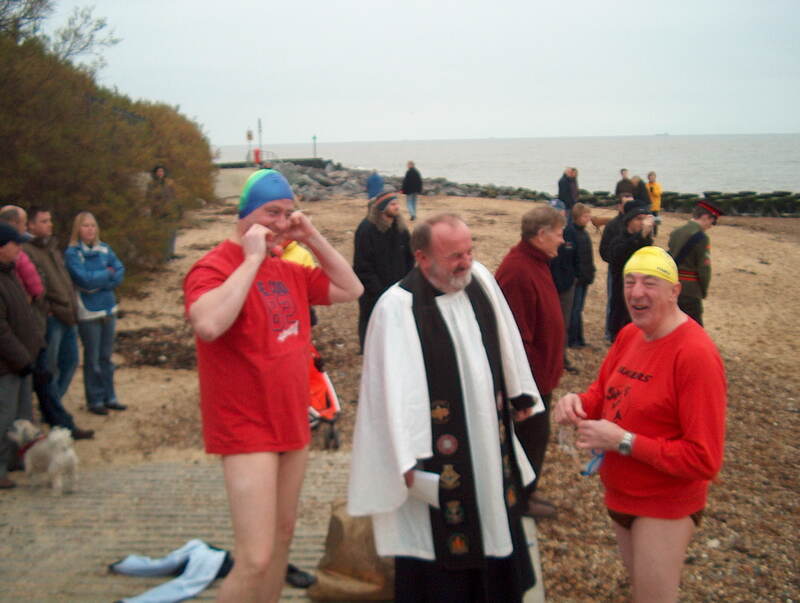 Whatever the politics that has gone in in Channel Swimming circles since then, and there has been a lot, all I know is this. 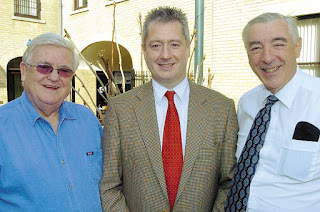 If it hadn't of been for Mike Read's inspiring talk at 'The Centa' in Bury St Edmunds, way back in 1980, I would not be sitting here writing this post now. 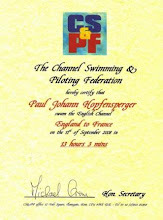 I would never have swum The Channel or represented my country at open water swimming. So when Mike's son asked me to write about how he inspired me, some 2-3 years ago now so that they could secretly get him an award, I was only too pleased to do so. His swimming experiences speak for themselves and so I would just like to say congratulations to Mike on receiving this award - Mike Read - Member of The British Empire.